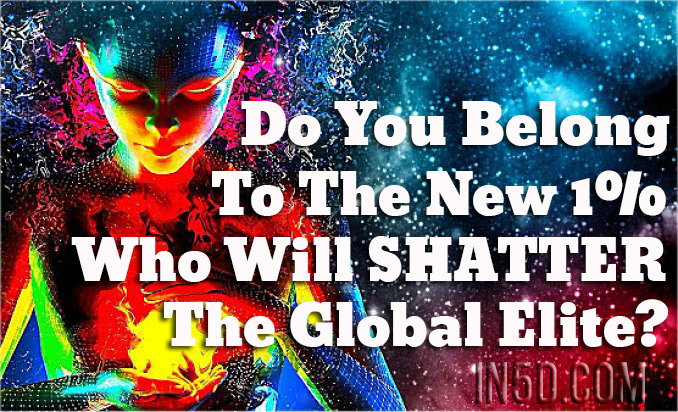 Who Is A Part Of The Global Elite? When we say The Global Elite we think of the wealthiest 1% who thrive through global consumerism. They don’t care about the result of their products as long as it brings massive profit. Their agenda is New World Order with hypnotized consumers living in One Government World. This way they can stay in power (meaning they’ll keep their businesses going) and their consumers will be “satisfied” (addicted) to their products without realizing the damage they create with consuming. Stop caring about what brand they wear. They see through the BS of media. They tend to unite the good from the indigenous and the modern, in a new sustainable lifestyle. They prefer walks in nature and nights around a campfire over getting drunk in clubs. They desire healthy organic food over processed food no matter the taste. They see the world as their home and the people as its global citizens. They love animals, nature and every human being as they realize we are all ONE! They SEE the world’s greatest lie “you are not enough” and THIS is their freedom. These individuals, completely unintentionally, show an alternative to the global consumerism. They show that in Nature there is everything that you need and in there, everything is free. They open a doorway to a new lifestyle where you are free from filling the endless void of your ego and you can focus on what truly matters, ascending into a higher frequency. That’s why they will shatter the Plan that The Global Elite has. Do you feel there is something wrong with society? Do you feel lost, as you are walking among people who are asleep? Do some (if not all) of the traits we mentioned above apply to you? Don’t worry, it simply means that you are awakening. Why? Nobody knows for sure. Maybe it’s a higher plan of The Universe or maybe there is something else in play. However, keep in mind that you are not alone.